In a brilliant move, the Trump Administration fulfilled America’s 18-year promise to recognize the holy city of Jerusalem as Israel’s capital. Unsurprisingly, the move has been met with consternation from the international community, the global Left, and Islamists everywhere. Europeans promised that it was an end to the status quo ex ante as we knew it; Iran vowed fire-and-brimstone; America’s purported NATO “ally,” Turkey demanded that the Trump Administration reverse its decision; the United Nations effectively condemned it, yet the positive response from many actors on the world stage has been equally surprising. The leaders of the Sunni Arab states–the countries with the longest history of hostility with the predominantly Jewish state of Israel–had relatively muted, almost ambivalent reactions. They issued their usual diplomatic opposition to the decision but nothing truly happened beyond that. Even the Iranians, who are using this to empower their own rise in the Mideast, have found that the outrage of their people is increasingly difficult to manufacture. More shockingly, however, has been the reaction of the Russian Federation. At a time when Russo-American relations are at the lowest point they’ve been in decades; during a period in which Russian nuclear forces are, for the first time since the end of the Cold War, stationed in Europe (Russian-controlled Kaliningrad)–with Russian forces purportedly poised to annex another Baltic state–the Russians have sided with the Americans in recognizing Jerusalem as the capital of Israel (with all the requisite diplomatic caveats, of course)! How can this be, though? After all, Russia is the primary benefactor for the Iranians and has, consistently, backed Iran’s growing aggression in the region. The Russians have ostensibly taken the other side (whatever that looks like these days) of the Syrian Civil War, and have boldly acted in defense of their long-time client, Bashar al-Assad, along with the help of their Iranian ward–much to the West’s chagrin. For the West’s part, economic sanctions continue putting the proverbial squeeze on Russia, severely debilitating their budding high-tech sector (as well as several other important parts of the ailing Russian economy). Since Russia is effectively a “giant gas station masquerading as a country” (in the eternal words of American Senator John McCain), Russia’s economic potential has been seriously weakened, as the international price of oil has remained relatively low (though that is starting to change). We in the West have been told repeatedly by our political class that the Russians are out to cause havoc for American foreign policy wherever they can. And there is always element of truth in such a claim–Russia and the United States are, unfortunately, not allies and likely will never be. But, is the rivalry we share with Russia an existential one, or is it circumstantial? I believe it is the latter. Russia has long felt threatened (whether reasonably or not) by foreign encirclement, something that is a product of Russian history. Since the end of the George H.W. Bush Administration, the United States has blindly backed what Russia refers to as the “double expansion” of NATO and the European Union to the point that the “borders” of the West are precariously close to Moscow. Given the technological, economic, and military superiority of the Western alliance, the Russian leadership is likely looking for any means to complicate and distract the otherwise unstoppable Western expansion into what Russia views as their defensive perimeter. Thus, Russian activities in the Middle East and their incursions into both Georgia in 2008 and the Ukraine in 2014 should be viewed in this context. The Russians, as I’ve previously argued in my ongoing lecture series at the Institute of World Politics in Washington, D.C., are also attempting to balance their desire for more positive relations with the oil-producing nations of the Mideast (Russia wants to dominate the global energy market) with a real need to stabilize Russia’s notoriously unstable southern periphery. So, the Russians have apparently gotten into bed with the Iranians, whilst entering into a new energy alliance with the Kingdom of Saudi Arabia. 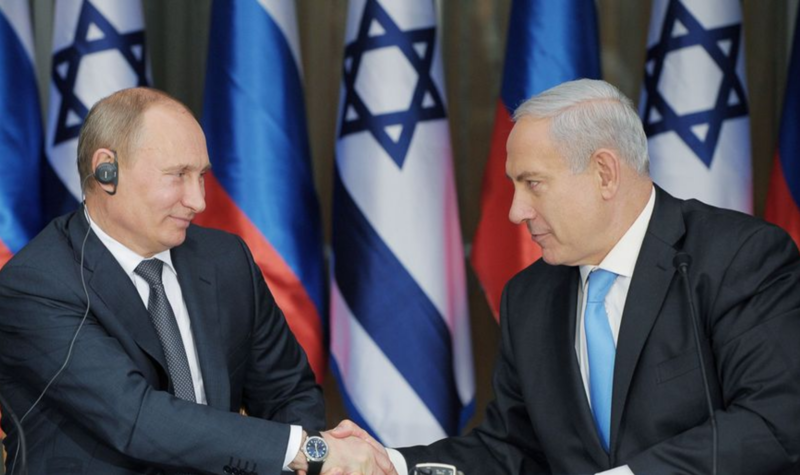 At the same time, however, Russia has been consistent in its calls for healthier and more productive relations with the long-time American ally of Israel. When the Trump Administration recognized Jerusalem, it not only brought the United States closer to Israel, but it also forced Russia to make a strategic choice: back Iran’s continuing quest for regional hegemony or reaffirm the American-led order in the region. For a country like Russia, that is so opposed to the American status quo in the region, the decision to back America’s play vís-a-vís Jerusalem seems strange. Would not a true rival to American power in the Mideast have more fully supported Iran’s burgeoning position in the region by openly opposing the recognition of Jerusalem? Especially since the Iranians and Russians have become so close over the last two decades? If this were the Soviet Union in the Cold War, the Russians would be backing Iran’s antipathy to Israel at the same time that it was stoking racialist and religious hatreds toward Israel in the Sunni Arab community. Yet, there doesn’t appear to be any such moves from Russia–at least not at this time. “Moscow is deeply concerned about the situation in the Palestinian-Israeli conflict. Palestine and Israel have not held political negotiations for nearly three years, and the situation on the ground has been deteriorating. The stalling of the Middle East peace process has created conditions for unilateral moves that undermine the potential for an internationally accepted solution to the Palestinian problem, under which two states – Israel and Palestine – could live in peace and security with each other and with their neighbours. Moscow reaffirms its support for the two-state solution as an optimal option that meets the national interests of the Palestinian and Israeli people, both of whom have friendly relations with Russia, and the interests of all other countries in the region and the international community as a whole. We reaffirm our commitment to the UN-approved principles for a Palestinian-Israeli settlement, which include the status of East Jerusalem as the capital of the future Palestinian state. At the same time, we must state that in this context we view West Jerusalem as the capital of Israel. Syria, another Russian proxy, followed suit with similar over-the-top rhetoric. Turkey, which is becoming fast-friends with both Russia and Iran, has come out strongly against the U.S. move. Yet, Russia has apparently taken a more middling approach to the entire situation; practicing an almost-Zen-like stance. It could be that Russia is simply letting its proxies do the heavy lifting of being insane while Russia acts as the stabilizing force, but it could also be that Russia, Iran, and Syria are not as well-connected as they’d like to portray themselves as being. Fact is (and this is a good thing), the Russia of today is not the Soviet Union of yesteryear. While the Russians have done some pretty boneheaded things to reaffirm the worst assumptions about Russia among the West’s political establishment, the Russians do not appear to be replaying the old Soviet foreign policy in the Middle East. In fact, the Russians appear to be acting the way that Russian strongman Vladimir Putin has always said Russia would behave: as a stabilizing force. Of course, this claim is highly overstated, both because Russian capabilities are so limited and Russian strategic aims are not exactly aligned with American interests. However, the Russians seem to intuitively understand that, after the disgustingly destabilizing actions of the Americans in the Middle East from the George W. Bush years until the end of the Obama Administration, a balance-of-power that favors traditionalism and stability is the vital elixir for the Middle East. Thus, the Russians backing Iran–to a point–and creating more amicable relations with the Sunni Arab powers, while at the same time following America’s lead in recognizing Jerusalem as the capital of Israel are all good things that actually work toward America’s favor. Or, at least, they work in the Trump Administration’s favor (no, this does not mean that Trump is “Putin’s man” in the Oval Office). The Russians may not be as zealous about conducting strikes against jihadists as their propaganda claims, but they are certainly not friends of the jihadists, as certain “mainstream” American and European pundits and news outlets have insinuated. The Russians have different metrics (and, again, more limited capabilities) to engage in the kind of strikes that are required against jihadists. Sharing a physical border with the Middle East; possessing a young and rapidly growing Muslim population in Russia, means that the Putin regime must act in a way that preserves Russian interests without completely destabilizing the region–especially with Russia being so weak, as it currently is. When he campaigned for office, Donald Trump made waves because of his willingness to point out the horrendous failures of America’s “Permanent Bipartisan Fusion Party.” The Trump Administration differs from its predecessors in that, while it will use massive military force to protect American interests (or to retaliate against those who harm American interests), no destablizing, quasi-Marxian-sounding wars of “liberation” will be waged. Instead, the United States will seek a stable, healthy balance of power to ensure the peace and bring about prosperity. It seems that, basically, Russia shares this vision, despite what the media claims. Russia is not our friend (and we need to always be on guard when dealing with them, and interact with them from a position of strength). However, Russia is not our enemy…unless we make them our enemy. The Russians have indicated with this recent decision to recognize Jerusalem as the capital of Israel that they are looking for a more amicable, stable solution to the cauldron of chaos that is the Mideast. Now is the time for President Trump to buck the idiotic orthodoxy of the Washington establishment and go to Moscow to make the deal of the century. Time is not on America’s side, though. The longer we freeze our relations with Russia, the more it sends Russia into Failed State territory; the more of a Failed State that Russia becomes, the more desperate (and dangerous) the Putin regime gets. The more desperate and dangerous the Putin regime gets, the more Russia becomes a vassal state of the growing Chinese superpower…and the more that the West is threatened in the long-run. Middle East politics creates strange bedfellows indeed! So, the Trump Administration should take advantage of this right quick, and build off it to stabilize the international system. Next France’s Mideast Play–Let Them Eat Sand!